The sport of swimming has seen many innovations over the last few years, some of which we have covered here on the Swimator Blog (new full body suits, technique improvement related swimming equipment or new insights on how to swim faster). However, one aspect of swimming that is being pushed to the background is the safety of the sport. When was the last time you heard about some new swim safety equipment being introduced around the swimming pools? If you think about it, there are numerous designs of life vests, floating rings from many materials, arm floaties (inflatable arm bands) for children, the long stick that a lifeguard extends to a swimmer in distress, lifeguard rescue tubes and swimming safety belts. All of these pieces of safety equipment are great to help a person to stay afloat, however, they all are either impossible to swim with or make swimming quite cumbersome. Bottom line is that personal safety during swimming does not get as much attention as it deserves, even though drownings during the popular mass triathlon races are not uncommon, however, this is about to change. A new revolutionary swim safety device was introduced to the open swimmer community which keeps you safe if you need it to, but it also does not hinder your swimming capability as the other swim safety tools do. Say hello to the "SaferSwimmer Float (Swim Safety Device or SSD)". 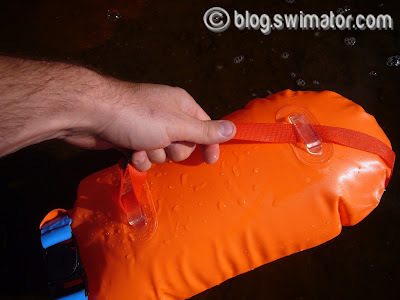 What it is the SaferSwimmer float (Swim Safety Device or SSD) and what does it do for you? I have already very briefly mentioned this product in the drowning prevention post earlier. As the name indicates, the Safer Swimmer keeps you or your children safer during most swimming activities (be it in the pool or open water). It basically works as an inflatable float which is attached with an adjustable belt to your waist and is carried in the current behind you. Now you might be thinking, well, that is not that revolutionary. You are right, this simply is not, however, the beauty comes in the fact that the device does not cause you to swim slower due to its resistance behind your body. When you swim, your body creates sort of a turbulent wave channel behind you with water moving in the direction of your swim. In more scientific fluid dynamics terms, this turbulent wave creates vortices which in turn produce a low pressure area behind the swimmer which causes the water to move along in the direction of the swimmer's swim. The swim safety device takes advantage of this water flow and is basically moved in the direction of the swim on top of the wave with very little resistance. It is very similar to the idea of when cyclists or swimmers are drafting behind each other in their road/open water races. The second cyclist/swimmer always works a lot less than the first who has to plow through the air/water to create the forward moving channel. Apart from its main function as a safety device, it also has an in-build dry bag-like storage compartment. 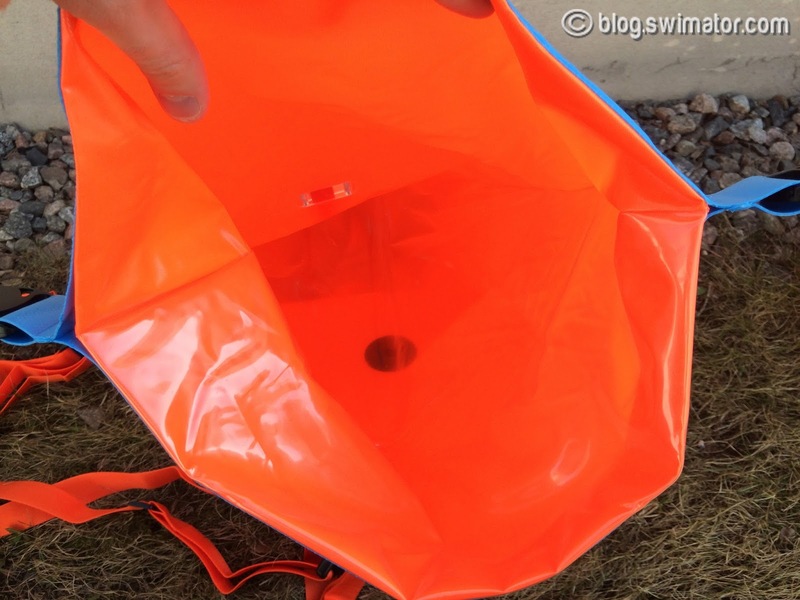 In this waterproof dry compartment you can store and take items with you for a swim that you'd normal have to leave behind in the car or on the beach. So, whether you bring with you your clothes, towel, phone, car keys, sunglasses, spare goggles, running shoes to run back to your starting place or sun protection lotion, they stay nice and dry and your mind can be focused on swimming instead of worrying whether someone is going through your stuff on the beach. If you are out for a longer swim, perhaps you might want to bring some nutrition and hydration products along, so you can replenish your energy levels and have a good workout. If you are into swim trekking or open water orienteering, perhaps a map sealed in a zip lock bag is in order, so you don't get lost. Another great feature is the bright orange color of the Safer Swimmer buoy. Being seen in open water swimming is a must, so any boats will go around the area you swim in. Open water swimmers usually wear a colorful swim cap to accomplish being seen, however, those caps are quite small and with the head being low in the water and waves going around your body, this is not ideal. 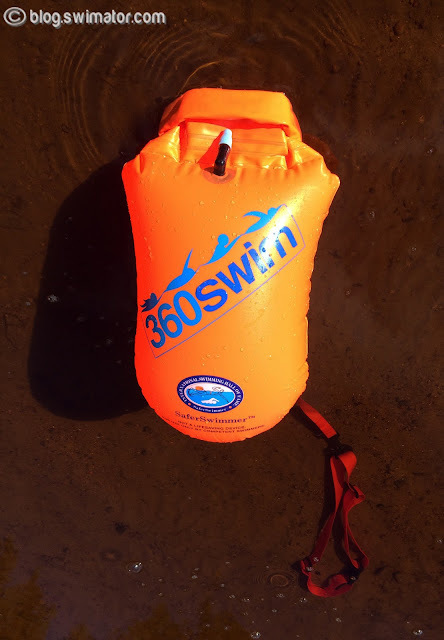 The SaferSwimmer with its 50cm long and about 20cm tall (when inflated) body makes a perfect statement in the deep blue since the orange color is hard to miss. The Safer Swimmer does not, however, have to be used only for swimming. Since it floats in a wake your body creates behind you, it is bound to float behind your kayak or a canoe, so if you are running out of space in the boat compartments or you just don't have any or you simply want to keep your beer cool, why not take the swim safety device along, fill it with the items you need to keep dry and let it float behind your boat while you paddle to explore near by coves. What are the specifications of the SaferSwimmer float? The product is made out of very durable PVC material or for the roughnecks out there Nylon with TPU coating material which supposedly even withstands an adult person standing on it while inflated (I have not tried this :)). The inflation with your mouth is done via a small external tube which has a wonderful tight-seal opening which will hold air in very well. It is much better than the valveless opening like we see on most common air filled children toys. 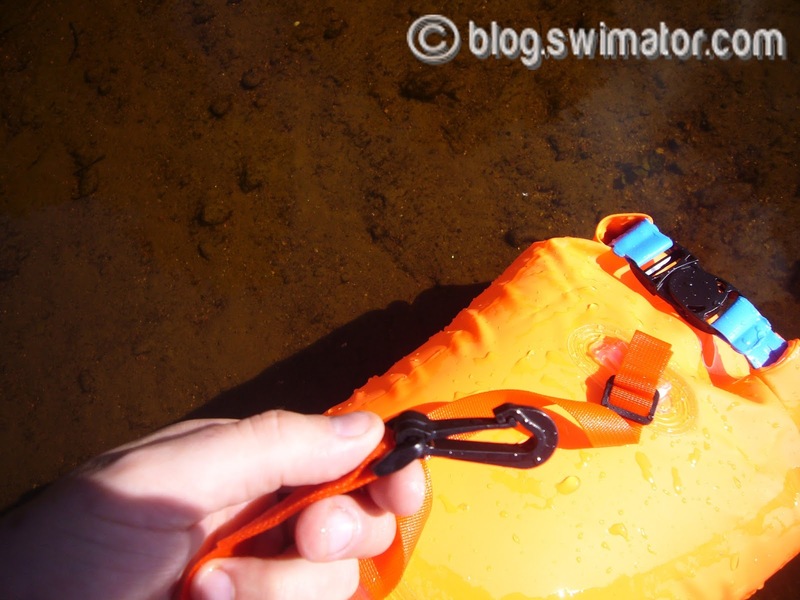 There is also a small handle on the float which can be handy when you are walking into the water or it is even more useful in the situation when you are using the float to rest during your swim. When you wrap your hands around the buoy, it could happen that you will slip if there is some slime built up on the float from the swim, however, if you grab the handle, you will get a much more firmer grip. The Safer Swimmer buoy comes with an adjustable waist band, so one size fits all solution is present. The waist bend has two nice big buckles, so putting it on is easy even for people with bigger hands. It fits very well over your wetsuits as well. There is also a sliding clip on the belt which is attached to a short non-adjustable connector which in turn attaches the belt to the float. If you position the belt buckle to the side (instead to the front as normal), you will notice that you have a smooth path for the belt clip to move from your back to the front, so if you need to switch from freestyle to backstroke and vice versa, nothing is hindering your movement. 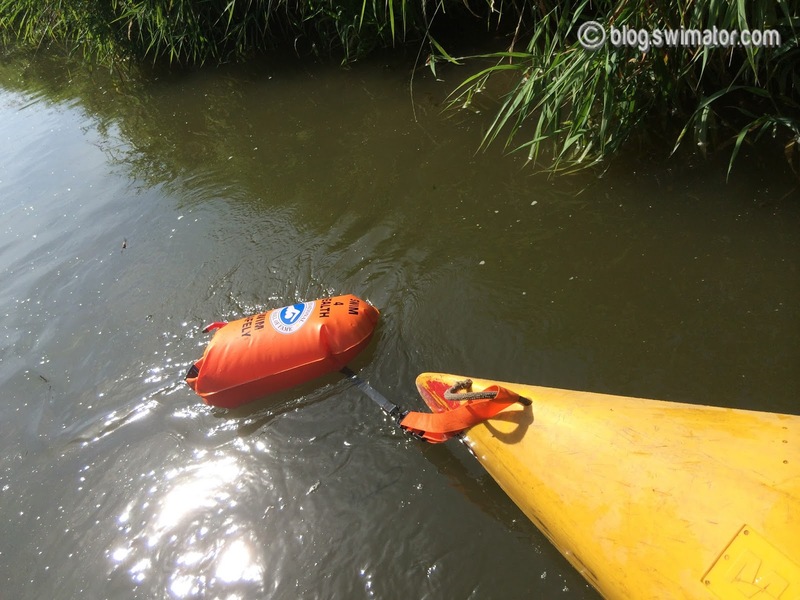 How to use the SaferSwimmer buoy? Roll the top of the bag over a few times to create a water tight seal and buckle the main bag buckle. One thing to note here, make sure to start the roll of the seal towards the inflator tube, otherwise, the bag will have a bit more resistance since it won't be as smooth on the side which is in the water. Adjust your waist belt to snuggly fit above your hips as well as the distance you want to float to have behind you. Storing the SaferSwimmer is very easy as well. If you swam in salty water, I'd suggest rinsing the float first, so you prolong the life of the material and not let the salt eat its way through it. Take your stuff out of the dry storage compartment, slowly deflate the buoy by unscrewing the inflator tube cap and when fully deflated and properly dried (ideally not on direct sunlight), fold it over a few times to get it into a manageable size. Now you have a very small, pocket size item which you can store in your car's trunk or a swim bag which is ready to be used next time you are out for a swim. How many ways can you use the SaferSwimmer? 1) Open water swimming - if you are an avid ocean, sea, lake, pond or river swimmer, I'd strongly encourage you to check out the TPU (heavy duty) safety device as you never know what currents, cramps or other irregularities could occur in your swim. As they say, better be safe than sorry. 2) Swim lessons - if you are a novice or a beginner swimmer who is either afraid of water or not as confident, this device could be the answer to your uneasiness. Simply attach it to your waist and get into the pool to do your swim lesson exercises totally undisturbed by the floating device. 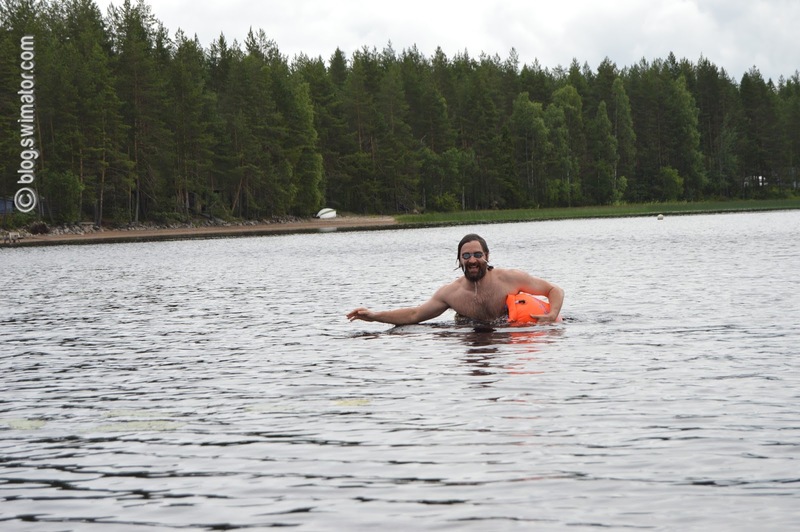 When you feel scared or tired, just grab onto the buoy, roll on your back and start floating to gather composure. 3) Children safety - safety around the pool should belong to a basic education for any child during their younger years. Many swimming lesson programs do very well with teaching children about safety, however, nothing is 100%. So, if you are worried to let your kids swim on their own or if you would like to improve your child's swimming skills, the SaferSwimmer could be a good answer to this. Instead of your child using the arm floaties or a kickboard where they have a horrible positioning of their body for swimming, they could use the swim safety float and thus have a backup solution if they need to take a rest. 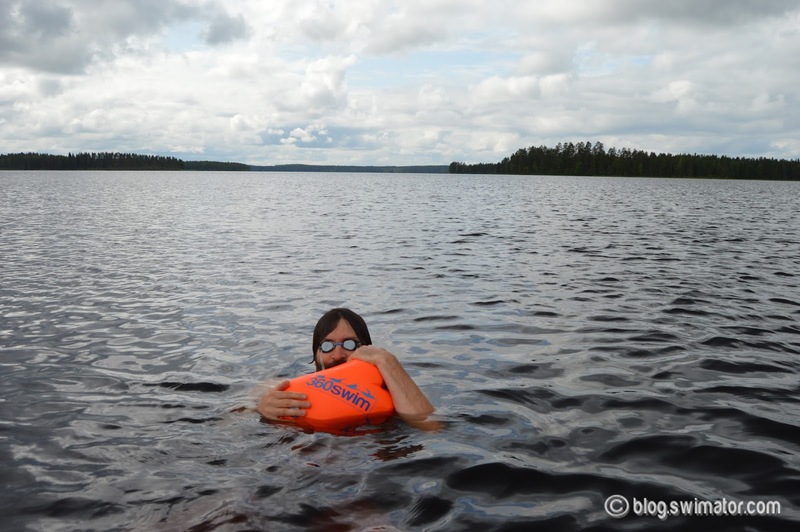 However, note that you should never let your kids swim unsupervised if they are not good swimmers, no matter what floating devices they have on. 4) Snorkeling - now everyone can enjoy peacefully floating above the coral reef without the fear of not surviving a fatigue and drowning. Just strap the safety product around your waist and get yourself lost in the wonders of the underwater world without worrying a boat will run into you. 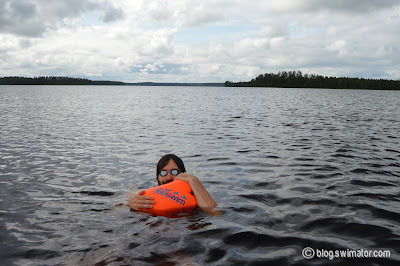 5) Swim trekking, island hopping, open-water orienteering - even if you are an advanced swimmer who is pushing the possibilities of the sport of swimming, taking with you the safety float is not a bad idea. Even if it is just for the sake of having some dry items with you, the safety feature could be just a plus as you never know what could happen. 6) SwimRun - the newer sport on the block is SwimRun. When you train for these races, it is important to keep hydrate and fed, so the smaller version of SaferSwimmer is a perfect solution to take with you. It can even be attached over the shoulder during your runs. 7) Group swimming - if the leader and a few other people in a group wear these buoys, it is easy for everyone else to navigate during the swim. The fastest swimmers will know where the end of the group is and the stragglers on the other hand will see how far ahead the leaders are. 8) Swimming and Triathlon events - open water swimming races have risen in popularity in recent years and with it also the danger of someone not judging their skills properly and entering a race they should not be in. 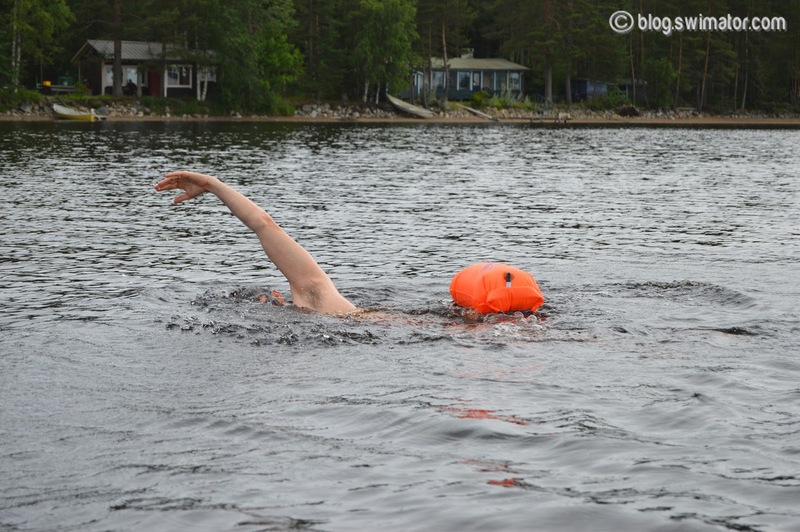 The SaferSwimmer can be a good tool for the organizers to help keep a certain aspect of safety for the event as well as a nice memory product for the participants to take with them home after the race. I'd urge all event organizers to consider using these safety buoys to promote safer sport. 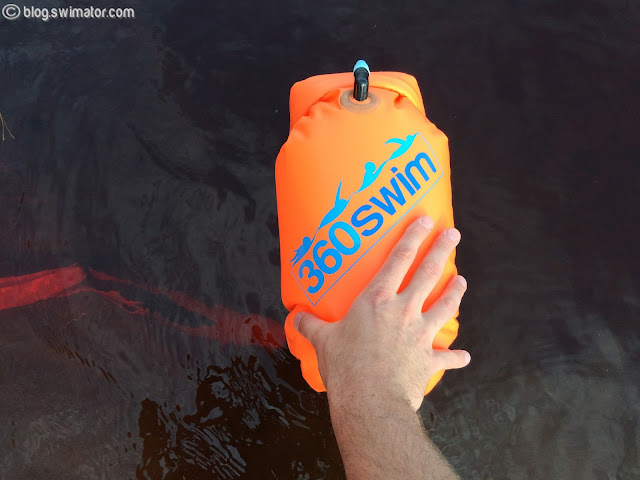 All and all, the SaferSwimmer buoy is a great addition to the swimming or snorkeling gear kit for anybody who wants to feel safe in the water. The float combined together with the Aquaspotter safety belt from GoatGear might just be the answers to the water safety needs of all open swimmers. Well, inflatable device is really important in swimming lessons for safety and more secure swimming. With this, we don't have to worry about our safety but just take extra care.